Leading academics from across the world were gathering at the University of Ulster today to discuss the controversial issue of racism in sport. The 4thInternational Conference on Sport, Race and Ethnicity, hosted by the Sport and Exercise Sciences Research Institute (SERI), was taking place at the Belfast campus. The former US Consul in Belfast, Barbara Stephenson, now ChargÃ© d'Affaires at the US Embassy in London, opened the two-day conference this morning. Organiser, Dr David Hassan from the University of Ulster, said: “There has rarely been a more opportune time to consider the full extent of the interplay of race, ethnicity and sport in the modern world. “This is a hugely significant year for sport in the UK with many of the world’s leading athletes descending on London for the Olympic Games. These mega-events create an opportunity to interrogate issues of race and ethnicity in modern sport. “In Northern Ireland, during 30 years of conflict and division, sport survived in abnormal circumstances. A key theme of the conference will be the role of sport in the creation and promotion of ethnic identities both at home and across the world." Among the speakers from Asia, America, New Zealand and Europe will be Professor of Sociology Earl Smith from Wake Forest University in North Carolina. “A major component of my talk is that race matters in all US sports, for example, golf, NASCAR, NHL, MLB, NBA, college sports, ownership, management and so on,” said Professor Smith. “Every inch of American sports has a "race elephant" in the room.Tiger Woods isthe only African American pro golfer of note. The Williams sisters are the only African American pro tennis players (male or female) of note. No African Americans drive NASCAR - a sport that takes little skill. Professor Smith has published extensively in the area of the sociology of sport. His most recent books include:Race, Sport and the American Dream(2nd edition 2009, Raleigh, NC: Carolina Academic Press) andInterracial Intimacies: An Examination of Powerful Men and Their Relationships Across the Color Line(2009, Carolina Academic Press). 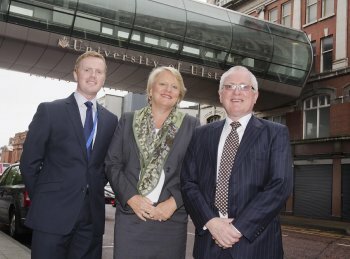 Caption: Former US Consul in Belfast, Barbara Stephenson, now ChargÃ© d'Affaires at the US Embassy in Londonwith Dr David Hassan (left) and Professor Alastair Adair (right). She opened theInternational Conference on Sport, Race and Ethnicity at the University of Ulster.